Do You Know Where Your Tax Dollars Are? Counties around the state are finishing up their budgets for the next fiscal year. This is the time of year we can easily see where our county’s tax dollars are going – and take a look at similar expenses for the counties around us. This year, and not for the first time, Northampton County wins the spendthrift award. Compared to Accomack County, and compared also to several eastern Virginia counties with similar populations, Northampton spends more per person for county administration, public safety and debt service, and provides more education dollars per student than most of the others. 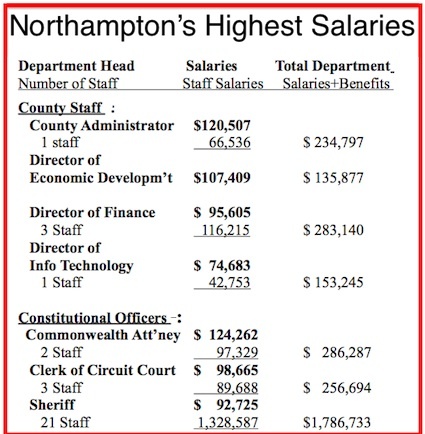 Northampton also tops the list in per-person local tax revenue collected.